Located on an United States Air Force site near Gakona, Alaska, the High-frequency Active Auroral Research Project (HAARP) is the world's largest and most functional ionospheric heater. Construction began in 1993. Today, HAARP can generate super high powered beams of directed energy. HAARP is designed to shoot these energy beams 200 kilometers up into the sky; affecting an area known as earth's ionosphere. In doing this, HAARP can perform a number of functions. The HAARP website explains the differences between HAARP and other ionospheric heaters like this, "HAARP is unique to most existing facilities due to the combination of a research tool which provides electronic beam steering, wide frequency coverage and high effective radiated power collocated with a diverse suite of scientific observational instruments." HAARP can be remotely operated. HAARP employs technology originally envisioned and demonstrated by American inventor Nikola Tesla. Technical expertise and procurement services as required for the management, administration and evaluation of the program are being provided cooperatively by the Air Force (Air Force Research Laboratory), the Navy (Office of Naval Research and Naval Research Laboratory), and the Defense Advanced Research Projects Agency. Since the HAARP facility consists of many individual items of scientific equipment, both large and small, there is a considerable list of commercial, academic and government organizations which are contributing to the building of the facility by developing scientific diagnostic instrumentation and by providing guidance in the specification, design and development of the IRI [HAARP]. 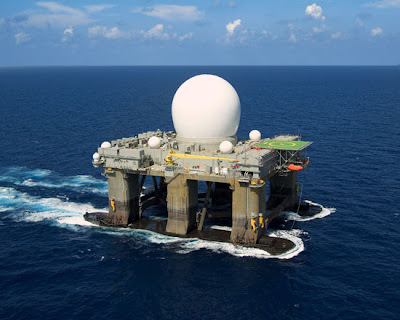 BAE Advanced Technologies (BAEAT) is the prime contractor for the design and construction of the IRI. Other organizations which have contributed to the program include the University of Alaska, Stanford University, Cornell University, University of Massachusetts, UCLA, MIT, Dartmouth University, Clemson University, Penn State University, University of Tulsa, University of Maryland, SRI International, Northwest Research Associates, Inc., and Geospace, Inc. The HAARP website notes that, "...major construction at the facility was completed during 2007." 12 U.S. patents are commonly recognized as applicable. A man named Dr. Bernard Eastlund is listed as the inventor on two of these patents and a co-inventor on another. Dr. Eastlund is commonly acknowledged as the inventor of HAARP. The 12 HAARP patents were all assigned to ARCO Power Technologies Incorporated (APTI); a subsidiary of Atlantic Richfield Company (ARCO). APTI also won the initial contract to build HAARP. In 1994, APTI was sold to a company called E-Systems. E-Systems then changed APTI's name to Advanced Power Technologies Incorporated. Largely involved in communications and information systems, E-Systems gets most of its business from and has extensive ties to the National Security Agency and the Central Intelligence Agency. In 1995, Raytheon acquired E-Systems. Raytheon, the defense contracting behemoth, now holds all 12 HAARP patents. As far back as 1958, the chief White House advisor on weather modification, Captain Howard T. Orville, said the U.S. defense department was studying �ways to manipulate the charges of the earth and sky and so affect the weather� by using an electronic beam to ionize or de-ionize the atmosphere over a given area. The seminal 1996 Air Force report 'Owning the Weather 2025' outlines a weather modification program utilizing ground based support such as HAARP. Eastlund's enthusiasm for planetary-scale engineering came through just as clearly in an interview with Omni Magazine. While acknowledging that many of the uses of his invention are warlike, he also talked about 'more benign' uses. His view of benign included using the technology to reroute the high-altitude jet stream, which is a major player in shaping global weather. Another way to control the weather with his technology would be to build 'plumes of atmospheric particles to act as a lens or focusing device' for sunlight, he told Omni. With this, the people controlling the antennae could aim in such a way that the return beams would hit a certain part of the earth. With the heating ability, they could experiment until they could control wind patterns in a specific place. United States patent #4,686,605 'Method and Apparatus for Altering a Region in the Earth's Atmosphere, Ionosphere and/or Magnetosphere' is one of the 12 HAARP patents. Dr. Eastlund is credited as the inventor. It states, "Weather modification is possible by, for example, altering upper atmosphere wind patterns or altering solar absorption patterns by constructing one or more plumes of atmospheric particles which will act as a lens or focusing device." Also as alluded to earlier, molecular modifications of the atmosphere can take place so that positive environmental effects can be achieved. Besides actually changing the molecular composition of an atmospheric region, a particular molecule or molecules can be chosen for increased presence. For example, ozone, nitrogen, etc. concentrations in the atmosphere could be artificially increased. Similarly, environmental enhancement could be achieved by causing the breakup of various chemical entities such as carbon dioxide, carbon monoxide, nitrous oxides, and the like. Transportation of entities can also be realized when advantage is taken of the drag effects caused by regions of the atmosphere moving up along diverging field lines. Small micron sized particles can be then transported, and, under certain circumstances and with the availability of sufficient energy, larger particles or objects could be similarly affected. That, my friends is a smoking gun. They are talking about introducing small particles into the atmosphere and then using HAARP to move them and the matter around them for the purpose of weather modification. HAARP can be used in conjunction with chemtrails in order to modify the weather. Disbursed metallic particles such as aluminum, barium and strontium (the main chemtrail ingredients) may increase the atmosphere's conductivity and therefore enhance HAARP's weather modification performance. A grand history of releasing stuff into the atmosphere as part of scientific research exists. DOD [Department of Defense] agencies already have on-going efforts in the broad area of active ionospheric experiments, including ionospheric enhancements. These include both space and ground based approaches. The space-based efforts include chemical releases (e.g., the Air Force's Brazilian Ionospheric Modification Experiment, BIME; the Navy's RED AIR program; and multi-agency participation in the Combined Release and Radiation Effects Satellite, CERES). Patent #4,686,605's description states, "It has also been proposed to release large clouds of barium in the magnetosphere so that photoionization will increase the cold plasma density, thereby producing electron precipitation through enhanced whistler-mode interaction." Barium is the second most common chemtrail ingredient. These chemical releases are not all necessarily chemtrails, but they show our military's extensive atmospheric chemical release activities involving ground and space based monitoring and support. ...there is a super-powerful electrical connection between the ionosphere and the part of the atmosphere where our weather comes onstage, the lower atmosphere. Furthermore, scientific theories describe how the electrical energetic levels of the atmosphere are connected to cloud processes. Chemtrails may enhance this connection between the lower and upper atmosphere. Then, when HAARP manipulates the ionosphere, the lower areas of the atmosphere (where our weather happens) can be manipulated accordingly. United States patent #5,068,669 titled 'Power Beaming System' outlines the technical details of how to remotely power airplanes. If HAARP is powering the chemtrail airplanes, this would be a great logistical advantage as the planes would not need to be grounded for fueling. The airplanes would probably only need to be grounded for payload and maintenance and therefore could remain in the sky, performing their functions without interruption for long periods of time. This would also be an advantage because the more time these planes spend in the air, the less chance there is of the program being exposed. It's incredibly difficult (as this author has learned) to expose something going on at 40,000 ft. in the sky. The power beaming need not be constant as the airplanes could utilize capacitors. It is reported that smaller, mobile versions of HAARP exist. Is it possible that the HAARP scientists could have miniaturized the technology so that they don't need such a large area of land and electrical power as called for in Eastlund's pattents? Manning asked him. "It's entirely possible," he [Eastlund] replied. "They have had a lot of good engineers working on it for some time. I would hope they have improved it." It has been speculated that this HAARP ship was used to trigger the March 2011 magnitude 9.0 Japan earthquake. There may be many HAAARP-like facilities of which we are not aware. There may be HAARP-like technology all around us! As noted earlier, ionospheric heaters such as HAARP are used in combination to increase capabilities and effectiveness. A little HAARP atop the Rocky Mountains at North American Aerospace Defense Command (NORAD) might work well. This is also the location from which I speculate the airplanes are commanded. The HAARP website claims that HAARP is not used for weather modification and the military has never admitted to these capabilities. The patents, Nick Begich, Jeane Manning and the European parliament say HAARP can modify the weather. Although the HAARP website claims experiments are only being carried out in a relatively small portion of the ionosphere directly over the facility, the HAARP executive summary says, "For broader military applications, the potential for significantly altering regions of the ionosphere at relatively great distances (1000 km or more) from a [ionospheric] heater is very desirable." The HAARP website claims that HAARP does not make holes in the ionosphere. The European parliament and the authors of Angels Don't Play this HAARP say it does. In February, 1995, the Star Wars missile defense shield was supposed to be dead. The United States House of Representatives by a 218 to 212 voted to kill the program. Yet HAARP continues on while the motives of the military are hidden from the world. The military and the HAARP website both claim that HAARP is not a classified project, but leaked documents show that the military planners intend to keep the program under wraps. The HAARP website contradicts itself about military involvement. In their self-description, they say they are a military project, but in the FAQs, they say HAARP is, "not designed to be an operational system for military purposes." All this while the military's executive summary says HAARP is to 'exploit' ionospheric processes for Department of Defense purposes. Eastlund said in a 1988 radio interview that the defense department had done a lot of work on his concepts, but he was not at liberty to give details. He later told Manning that after he had worked within ARCO for a year and applied for patents, Defense Advanced Research Project agency (DARPA) had combed through his theories then gave out a contract for him to study how to generate the relativistic (light speed) electrons in the ionosphere. Eastlund told Chadwick of National Public Radio that the patent should have been kept under government secrecy. He said he had been unhappy that it was issued publicly, but, as he understood it, the patent office does not keep basic 'fundamental information' secret. 'You don't get a patent if you don't describe in enough detail to another person how to use it,' he said. Specifics of military applications of his patent remain proprietary (secret), he added. I guess it's just a matter of who you trust. I choose to trust the patents, Nick Begich and Jeane Manning because, about HAARP, the government has been caught lying. To my knowledge, the authors of 'Angels Don't Play this HAARP' have not once yet been found to be lying. The patents speak for themselves. I speculate that HAARP, when and if used for nefarious purposes (such as weather modification in co-operation with chemtrails), is remotely operated from Lawrence Livermore National Laboratory, Los Alamos National Laboratory and/or Wright-Patterson Air Force Base. During my humble investigation, I found that these three locations have produced much of the leading research and development. HAARP is an incredibly high-tech machine. You need highly skilled scientists and engineers to run the thing. The best place to run HAARP would be from a laboratory where the technology was developed. Also, most people (top scientists included) are generally not so hot about relocating to the wilds of Alaska. As noted earlier, HAARP can be remotely operated. We know HAARP can modify the weather. If one could, don't you think they would? Weather control is god-like power. Chemtrails may be sprayed to enhance the effectiveness of these operations. If this is the case, our government's pattern of lying and obfuscation about HAARP makes perfect sense and is consistent with behavior exhibited by others associated with every aspect of chemtrails, geoengineering and the related activities I outline.